Every now and then an absolute stunner of a venue comes along that just blows you away. 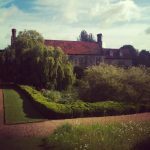 When we first found St Clere (thank you Twitter!) and met Eliza and her team we just knew that any couple would be mad not to fall in love with it. With endless possibilities and exclusive use, St Clere Estate is simply perfect. But you’ll need to be quick. The privately owned estate is only opening up its doors for a limited number of wedding dates in July 2014. St Clere is in the heart of the Kent countryside with remarkable views of the North Downs and can cater for up to 180 guests. 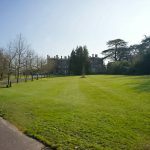 They offer a full package, where you can have drinks and canapés within the formal rooms of the house and on the terrace enjoying views of the immaculate gardens. 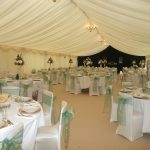 Then your wedding breakfast and evening entertainment are set just a stones throw from the house within a lavish marquee. For the Bride and Groom there is also the option of staying in a luxury Yurt so you can spend your first night as a married couple looking up at the stars in the tranquil St Clere gardens. 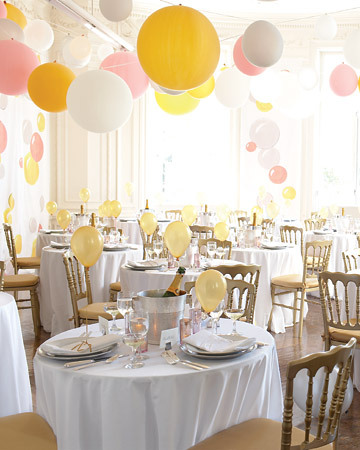 We’re also super excited about this venue as The Wedding Dolls come as part of the wedding package, which means all St Clere couples have a totally unique and stunning wedding day that is full of personality. Visit St Clere to find out more about the wedding package and all that this beautiful estate can offer – if you’re anything like us you’ll love it as well. Now we’re not usually ones to chat about old bones at the Wedding Dolls HQ but with the discovery of Richard III this week it’s got us thinking about how Castles bring with them a unique mix of history and new beginnings. 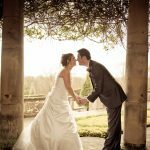 For us today’s real wedding is the perfect example of mixing old and new and all that’s great about England and it’s historic castles and manor houses. 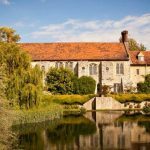 Bevan and Melissa were married in August 2012 at Chiddingstone Castle, Kent with 60 guests at the ceremony and wedding breakfast and a further 50 guests for the evening reception. Here Melissa tells us about their big day. “We wanted a venue that was in between my home town of Forest Row, East Sussex and Bevan’s home town of Gillingham, Kent. 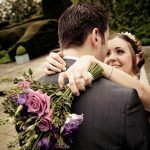 We looked at lots of venues across Kent on a really rainy day and fell in love with Chiddingstone Castle. 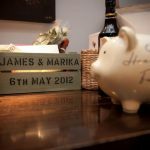 It’s country vintage style suited our wedding theme and the exclusive use of the castle was just what we were looking for. It looked perfect even in the pouring rain! 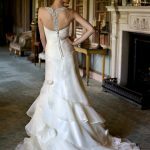 “I wanted a dress that was grand enough for the castle setting while still fitting our traditional English vintage theme so I chose a Sassi Holford dress which suited my figure perfectly and I loved the simple design with delicate lace embellishments. My shoes were my extravagance. I’d looked at millions of pairs but once I saw Blush Bloom’ by Freya Rose they were the only ones that would do! Melissa Morgan Designs created both mine and the Bridesmaids jewellery. My favourite was my headpiece that Melissa designed and made for me using a vintage brooch I bought in a local antique shop. “Our theme was Traditional English vintage with touches of a classic afternoon tea, we used accent colours of pale pink and green. The theme can together perfectly and I was so delighted with it! I snuck into the Great Hall while we were getting ready and had a peek at the tables – I nearly burst into tears! “We are big big tea drinkers so all of our tables were named after types of tea – the top table was our favourite, English breakfast! As soon as we got engaged I started collecting vintage tea cups and saucers from antiques fair, car boot sales and charity shops. I filled each of these with pale pink wax to make tea cup candles for our female guests and the men and children had tea pot shaped cookies. The centre pieces were hired vintage tea pots, cake stands and tea cups filled with beautiful country style floral arrangements. We knew exactly what we wanted for our stationery but neither wanted to spend ages making the save the dates, invitations and seating plan so we enlisted the help of Frances Symes. I ordered a tea cup and tea pot paper stamper from America and Frannie did the rest! 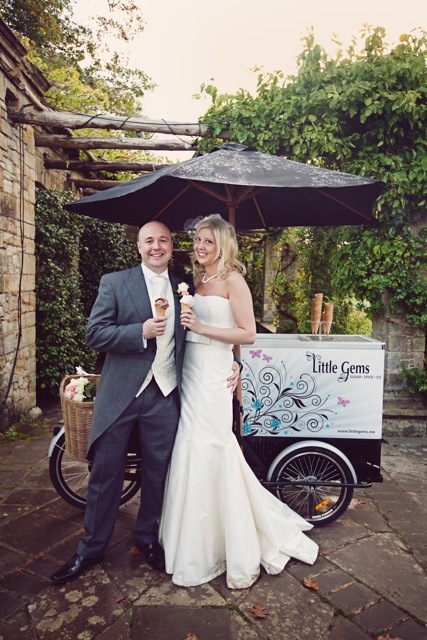 “Our photographer, Martin Briggs was listed on the Castle’s list of trusted suppliers. We looked at his work online and loved his pictures and when we met him we could see how talented and passionate he was. He also used to live in Chiddingstone Castle so knew exactly where all the best spots for pictures were! We didn’t really need a wedding car but I absolutely love Morris Minors so Bevan hired a 1961 white convertible for me from Alfred’s Wedding Cars to get to the venue. 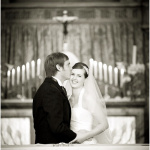 “Our wedding breakfast was wonderful! For canapés we had Rare roast beef in mini Yorkshire puddings with horseradish cream, Pork belly on creamy apple dauphinoise, with cracking and applesauce, Cornish crab fritters with avocado mousse and Beetroot rosti with whipped goats cheese and truffle honey – gorgeous! Then to start we had Scallops with parsnip puree and crispy pancetta, for main course Confit duck leg with slow roasted garlic mash, garlic sprouting broccoli, spice duck filo parcel and a pickled plum sauce and to finish we had Hot chocolate fondant with vanilla sour cream. 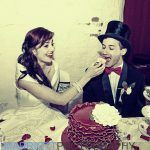 The food not only tasted fantastic but it looked amazing – we even have photographs of it in our wedding album! Sounds like the perfect end to a fantastic day! Thanks to Melissa and Bevan for sharing their day with us. Flowers/Styling by: Karen Woolven – Karen interpreted my theme and colours beautifully. Drinks reception entertainment: Greenwich String Quartet – they were incredible. I was at the London Golf Club last week to help out at a charity golf day. Whilst there I managed to sneak off my duties for a bit to get a good look around at it’s potential for a wedding venue. 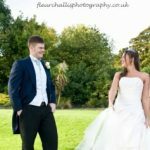 I’ve never been a big lover of weddings at golf clubs so I wasn’t expecting to like this much but I have been left eating humble pie as it makes a great wedding venue! The London Golf Club is in a beautiful setting with the Clubhouse at the heart of the 700 acre estate complete with lakes and fountains to create a seriously stunning backdrop. From the gatehouse there’s an impressive driveway for real wow factor as soon as you arrive. The Great Hall with magnificent oak beams and the Long Bar are fabulous rooms to entertain your guests and the banqueting room is really light and airy with a luxurious feel. The patio and terrace areas are also great for drinks and wedding pics during the summer months. Forget stuffy old golf club here as everything is modern, fresh and very well executed including the menus. Catering prices start at £99 per person and include room hire. The views over the lakes and Championship fairways are enough to make this venue special but the attention to detail and really friendly staff just make the whole package one worth considering. Definitely a hole in one for a perfect wedding! Today it’s sunny and we’re super excited as we’ve just signed up to be part of Alice and Rose Presents, Vintage Wedding Fair on Sunday 16th September. 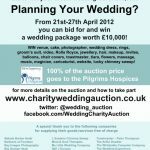 It’s a really different kind of wedding fair with a relaxed atmosphere and lots of fun along the way. On the day you can expect to be entertained with live music, a bridal pack with wedding mag and discounts, a glass of bubbly on arrival, competitions and the chance to meet lots of lovely suppliers who can help you pack a punch when planning your vintage wedding. 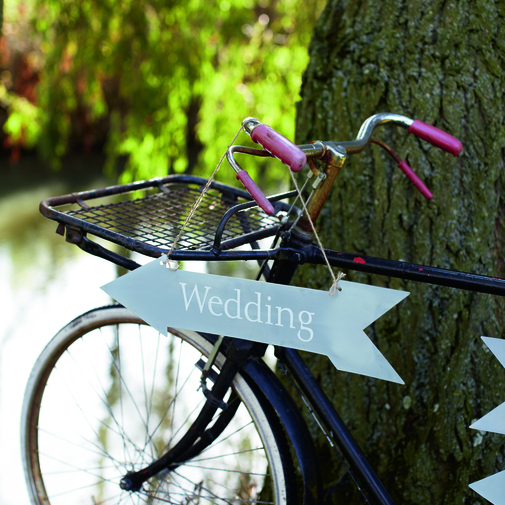 And of course you can now meet us to chat through any wedding worries you might have. We suggest you bring a picnic on the day and enjoy some breathtaking views across the Kent and Sussex countryside. Plus there’ll be a bar open serving beer,wine and soft drinks and you can even meet the local animals that call Hollambys Farm their home. The fair is at Hollambys, which is a small organic farm in Groombridge. Their converted Sunset Barn, overlooking Birchden Field, is perfect for a country wedding and is a fabulous place to check out for your vintage wedding. Plus did I mention that it’s free entry? So don’t hang about pop over and see Alice and Rose Presents for more information now.